Preheat oven to 350° F. Line muffin tins with 12 foil cupcake papers. Place a vanilla wafer in the bottom of each cupcake paper. In mixing bowl, beat cream cheese and fat-free cream cheese until smooth. Add sugar and vanilla and mix well. Add eggs and beat until smooth. Pour cheesecake mixture into muffin tins. Bake for 20 minutes or until centers are almost set. Cool. Refrigerate 2 hours or overnight. 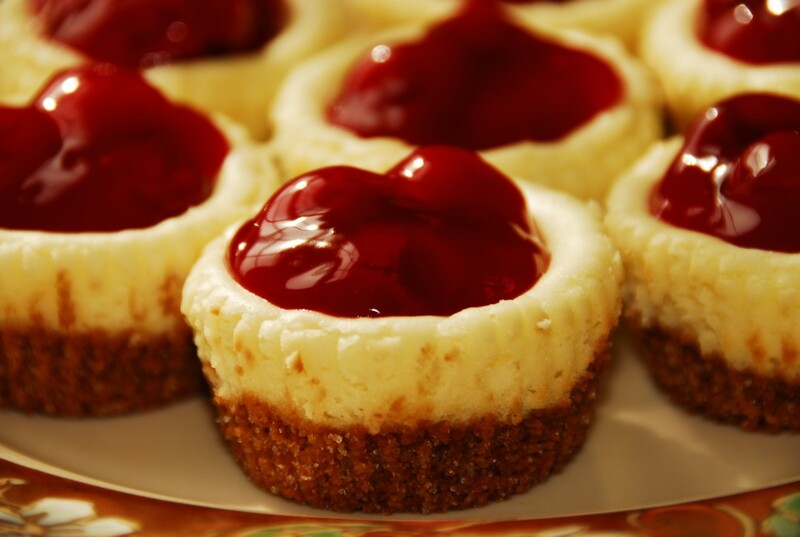 Decorate cheesecake tops with cherry pie filling. Note: You can use splenda 1/4 of a cup is only 184 calories. using 1 tbsp of frozen strawberries in syrup is only 35 calories per cake, rather than 60 for cherry pie filling. Saving 45 calories per serving. Making each serving only 85 calories.